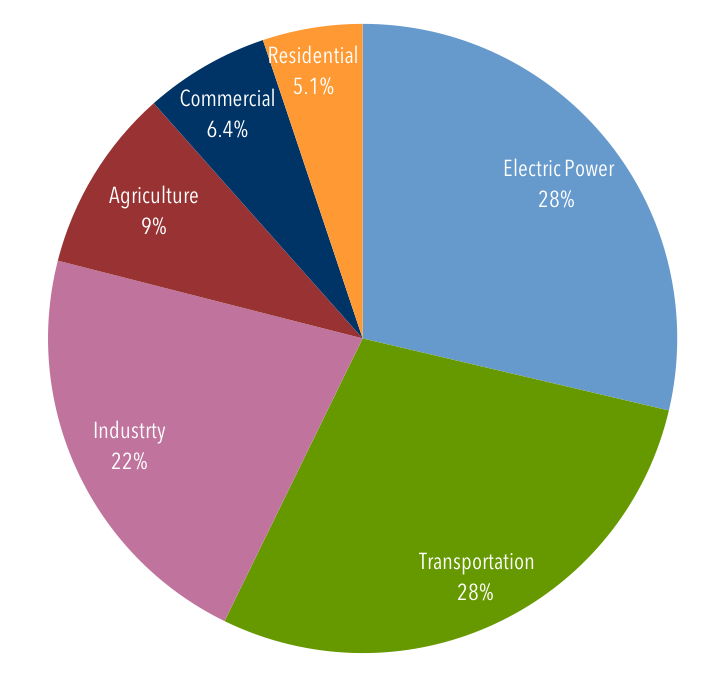 28 percent of U.S. greenhouse gas emissions come from generating electricity. EPA has authority under the Clean Air Act to monitor and regulate greenhouse gas emissions. The U.S. Supreme Court first confirmed this interpretation of the law in 2007. Power plant greenhouse gas emission regulations are being reviewed by EPA. Regulations on other pollutants from burning fossil fuels remain in effect. 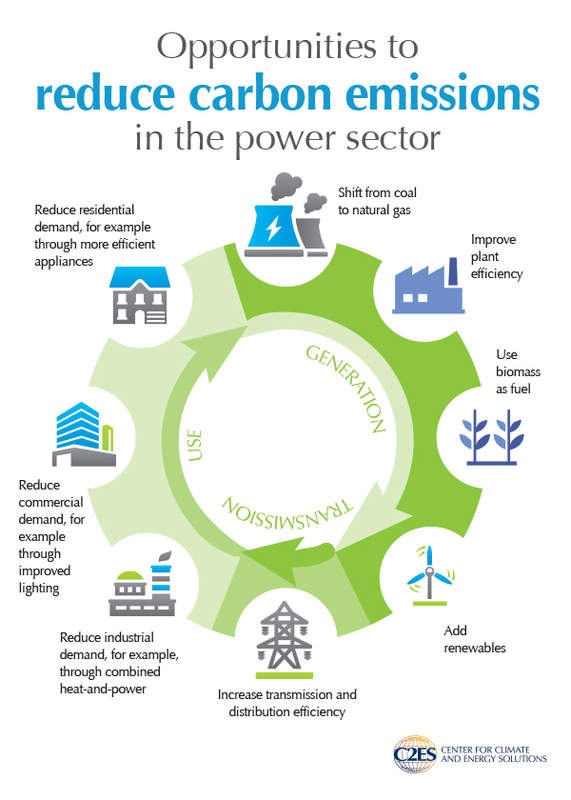 Electric power generation is responsible for 28 percent of U.S. greenhouse gas emissions. These emissions come from the combustion of coal or natural gas to make electricity. Greenhouse gas emissions from the power sector have fallen dramatically since their peak in 2005, but nonetheless represent a major source in the economy. Despite growing renewable generation, fossil fuels still account for about two-thirds of U.S. electricity. Multiple laws and court cases give the U.S. Environmental Protection Agency (EPA) the legal authority to monitor and regulate greenhouse gas emissions. Regulations were proposed (and some were finalized) after EPA’s authority to directly regulate greenhouse gas emissions under the Clean Air Act was clarified in the U.S. Supreme Court decision in Massachusetts v. EPA (2007). In response to an Executive Order issued by President Trump, EPA is now proposing to repeal and replace key regulations adopted or proposed by the Obama Administration. Natural gas surpassed coal in mix of fuel used for U.S. power generation in 2016. EPA is regulating greenhouse gas emissions from power plants under Section 111 of the Clean Air Act which allows EPA and the states greater flexibility in crafting and implementing a standard. Emissions from new and modified power plants have been finalized under Section 111(b) as described below. Emissions for existing power plants are still being developed under Section 111(d). In August 2018, EPA proposed GHG emission guidelines for existing fossil fuel-fired power plants and accompanying revisions to how GHG guidelines are implemented in the Affordable Clean Energy (ACE) Rule. If finalized, the rule would direct states to require coal-fired power plants to use prescribed technologies to improve their heat rate, a measure of efficiency. The ACE Rule is expected to reduce power sector emissions by about 1 percent from a business-as-usual scenario. It would replace the Clean Power Plan, finalized in August 2015, that had set state-specific emission rates and provided various market-based flexible compliance provisions. The Clean Power Plan has never been implemented because of a U.S. Supreme Court stay issued in February 2016. The formal repeal of the rule is being implemented by EPA at the same time that the ACE Rule, which would replace the Clean Power Plan, is being developed. EPA released a final rule to limit greenhouse gas emissions from new power plants on August 3, 2015. The final “Carbon Pollution Standard for New Power Plants” establishes New Source Performance Standards (NSPS) to limit emissions of carbon dioxide (CO2) from fossil fuel-fired power plants. New natural gas power plants can emit no more than 1,000 pounds (lbs) of carbon dioxide per megawatt-hour (MWh) of electricity produced, which is achievable with the latest combined cycle technology. New coal power plants can emit no more than 1,400 lbs CO2/MWh, which almost certainly requires the use of carbon capture and storage (CCS) technology. The rule is in effect, although it has been challenged in the courts and EPA is reviewing it. EPA expects this CO2 standard to have negligible costs through 2022 (the intended time horizon of the standard), since very few new coal plants are planned, even without the proposed standard, and since developers of new natural gas plants should see minimal, if any, additional costs for compliance. This standard was adopted under Section 111(b) of the Clean Air Act, which applies to new, modified, and reconstructed power plants, and requires EPA to set a numerical performance standard based on the best available technology that has been adequately demonstrated. States have little flexibility in applying the standard. Fossil fuel combustion at power plants emits other pollutants regulated by the Clean Air Act. Environmental controls on these other pollutants like SO2, NOx, and mercury often (though not always) result in greenhouse gas emission reductions. 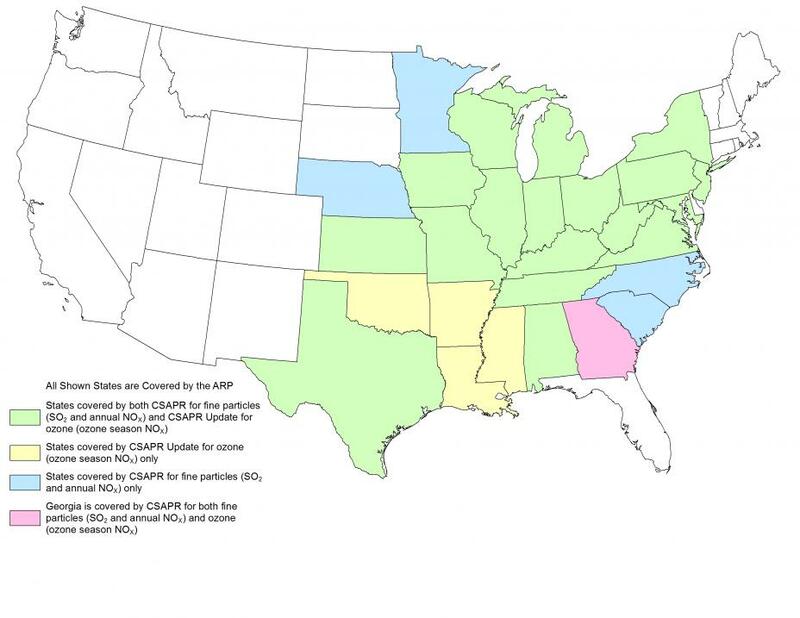 Cross-state Air Pollution Rule (CSAPR, pronounced “Casper”) – This rule covers the oxides from nitrogen (NOx) and sulfur dioxide (SO2) that create ozone and fine particulate matter (PM). Emissions of these pollutants from upwind states prevent downwind states from achieving air quality standards. CSAPR covers a few thousand sources in the Eastern part of the United States and employs tradable air permits to reduce emissions. After several years of litigation, the rule came into effect in 2015. Mercury and Air Toxic Standards (MATS) – This rule limits emissions of mercury from coal- and oil-fired power plants (natural gas does not contain mercury). Since the rule took effect in 2015, some coal-fired power plants have retired, but most operators chose instead to install control technology to reduce these emissions. EPA has separate authority under environmental laws to regulate power plant emissions and activities that have other harmful impacts, such as cooling water intakes and coal ash disposal.